Ultimately, the iTwo is an unremarkable, workmanlike interface that sounds good and comes in at a reasonable price. Respectable sounds at a decent price. Uses same USB power adapter as iOS devices. Fairly unremarkable compared to the competition. 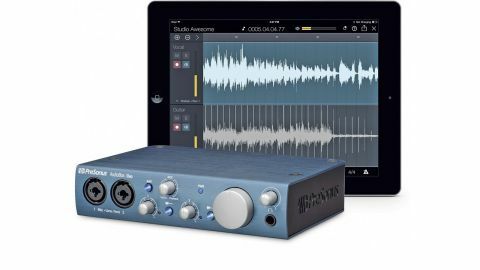 PreSonus' new AudioBox iTwo 2-in/2-out 24-bit/96kHz mobile USB audio interface for Mac, PC and iOS isn't the smallest on-the-go solution we've come across, but it is lighter than it looks and is solidly built. The two inputs are on XLR/balanced combis, the outputs are on balanced jacks, and a 1/4" headphone jack and 5-pin MIDI In/Out are onboard. "Direct monitoring is supported, with an output Mix knob blending between direct input and DAW playback"
Direct monitoring is supported, with an output Mix knob blending between direct input and DAW playback, while the main and headphone outs each get their own level knobs. A pair of buttons switch between line and instrument level signals on each input channel, and a third button switches phantom power on and off. Mac and PC users can power the iTwo via USB, but using it with iOS means plugging it into the mains (using a USB power adapter/charger, such as the standard Apple one ) as well as to the host device itself.